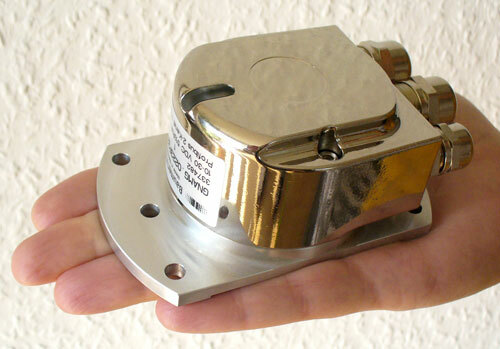 Inclination sensors GIM500R: 1- or 2-dimensional. Size 52 mm. MEMS capacitive measuring principle. EN13849 compliant firmware. E1 compliant design. Interface CANopen, SAE J1939, Analog (4...20 mA / 0.5...4.5 V / 0...5 V / 0...10 V). Connection M12 and cable. Protection up to IP 69K. High repeatability. High sensitivity. Measuring range of the GIM500R (1-dimensional) is 0...90°, 0...120°, 0...180°, 0...270°, 0...360°. Measuring range of the GIM500R (2-dimensional) is ±10° / ±30° / ±45° / ±60° / ±90°. Inclination sensors GIM140R: 1- or 2-dimensional. Size 52 mm. MEMS capacitive measuring principle. EN13849 compliant firmware. E1 compliant design. Interface CANopen, SAE J1939, Analog (4...20 mA / 0.5...4.5 V / 0...5 V / 0...10 V). Connection M12 and cable. Protection up to IP 69K. High repeatability. High sensitivity. Measuring range of the GIM140R (1-dimensional) is 0...30°, 0...60°, 0...90°, 0...120°, 0...180°, 0...270°, 0...360°. Measuring range of the GIM140R (2-dimensional) is ±10° / ±30° / ±45° / ±60°.